A spring day in New Zealand brings mild conditions, often tinged with a fresh spring breeze, to invigorate a multitude of outdoor activities and one of the best ways to take in the springtime is on the seat of a bike to enjoy Spring Cycle Rides. Hawke’s Bay, on the eastern coast of the lower North Island, is the perfect spot to combine cycling with a drop of wine tasting. Starting at the Black Barn Vineyard, cyclists make their way through vineyards, orchards and along the coast on this short one-hour leisurely ride. During spring the vines take on a spectacular green and orchard trees are in full blossom. 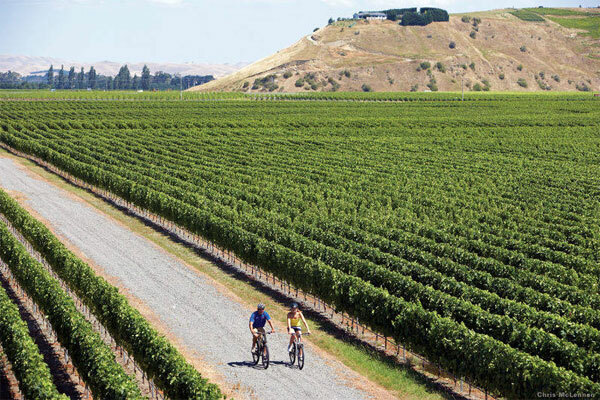 The cycle trail makes its way to the famous Elephant Hill winery, one of New Zealand’s leading wine producers. The recommended finish is in Elephant Hill’s restaurant – a great spot for lunch and to taste some of the produce the Hawke’s Bay’s region is famed for. Takaro Trails can design a cycle tour to suit you and are happy to privately guide guests on the trails. If the sun is shining and you fancy a doddle between the vines and olive groves, then pick up your e-bike from Green Jersey Cycle Tour Company in Martinborough. They’re located in a big shed right on the main road into the little wine village and from there it’s only a short ride into the pleasant olive groves and famed vineyards of this boutique wine region just north of Wellington. Green Jersey offers guided cycle tours or bikes to rent – choose from a big selection of comfortable pedalling machines, an e-bike that makes pedalling easy or let someone else do the work while you ride in the rickshaw. Along the way, you can taste local delights – there’s a bunch of nice cafes in town, cellar doors and an olive oil tasting room all within a short ride of the village. Wellington – New Zealand’s capital city – is a haven for cyclists. During the morning commute the bikes often outnumber the cars around the city. In addition to getting to work, cycling is a great way for a tourist to see New Zealand’s culture capital. The Enormous Crocodile Company is a novel way to explore the Wellington coastline on wheels with a 3- or 6-seater quadricycle. Discover Oriental Bay, with its cafés, popular beach and swimming pontoons, cruise past Te Papa Tongarewa – The National Museum, and follow the Writer’s Walk to Kupe’s statue at Queen’s Wharf. Switched on Bikes offer electric bikes and guided tours of Wellington. E-bikes make cycling easy and a short 7km course will reach Zealandia, the world’s first fully-fenced urban eco-sanctuary, where admission is free to visitors who arrive on a Switched On e-bike. Zealandia even has a charging station for your e-bike. Inside the sanctuary there are rare native birds and New Zealand’s own dinosaur, the tuatara. 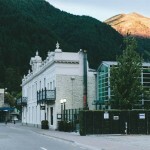 Queenstown is famed for high adrenalin adventure activities such as bungy jumps and jet boating, but it is also an awesome spot for some leisure cycling. The Gibbston River Ride, a section of the Queenstown Trail, begins at the historic Kawarau Bridge – home of the world’s first-ever bungy operation. Take the leap yourself or watch a few other people do it before heading off along the trail into wine country. Visit some stunning wineries including Peregrine and Gibbston Valley and taste some of the pinot noir that has made this region famous for its grapes. Around the Basin bike tours have several tour options and can customise a tour to suit you.